We are continuously strengthening our position as the leading supplier of high quality sauna and steam bath products worldwide. To ensure a high level of safety, we comply with international safety regulations and recommendations such as CE, FI, VDE, UL and ETL. In 1997, Helo Ltd was granted an ISO 9001 certificate for its quality management systems. Our production design and improvement team develops solutions that make it possible to reduce energy consumption. We pay attention to environmental factors in our choice of raw materials and strive to make the most effective use of them. In 2000, Helo Ltd was granted an ISO 14001 certificate for its environmental management systems. Our goal is to continuously reduce the amount of waste and maximize the useability of raw materials in the manufacture of our products. The company was established in 1919 as Karjalan Sahko Ltd in Vyborg, Finland. In 1949, the first prototype electric sauna heater was built. During the 1960s the company moved to its current location in Hanko, Finland, and was renamed Helo Tehtaat (Helo Factories). In the 1980s, Helo acquired 3 of its competitors and production was transferred to a new, purpose-built factory in Hanko. The name of the company was changed to Oy Saunatec Ltd in 1990, and the company kept growing. In the early 1990s the company acquired the world’s largest sauna room manufacturer, Knüllwald Sauna GmbH in Germany, and two new subsidiaries were founded, Saunatec Inc. in the United States and Helo (UK) Ltd. in Great Britain. 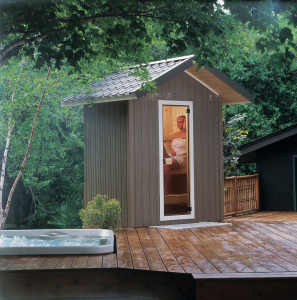 Towards the end of 1990s, Oy Saunatec Ltd acquired the sauna and steambath business of Amerec (Nasscor Inc.) in Seattle, US, and a Finnish sauna heater producer, Viki Sauna Oy. In 2008, sales and marketing operations were set up in Russia. Today the company is named Helo Group Ltd and is the world’s largest sauna and steam company. Helo products are exported to more than 80 countries.